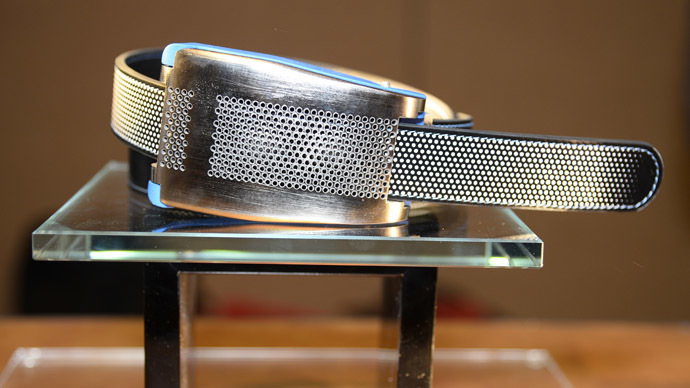 A "weight-friendly" belt buckle that loosens itself after you've eaten too much has been unveiled at the International Consumer Electronics Show (CES) in Las Vegas. The new fitness gadget, called the Belty, can automatically adjust itself, depending on the user's overall state of health, the waistline being one of the key indicators. It also nudges a lazy person if he or she has been sitting motionless for too long. The Belty, the brainchild of French startup Emiota, is equipped with an array of tiny sensors. The heavy-looking device also boasts a selection of motors that expand and retract when your waist size changes after a meal or a workout. The Paris-based company hasn't yet revealed when and whether the smart belt will hit the market, and how much it would cost. A Belty representative told Mashable it is a "high-end product," however.